I have just read two psychological thrillers on the bounce as my thirst for something mentally taxing and suspenseful overran my usual penchant for tear jerkers or romance. For a debut novel, this was a great read. Not gory, blood thirsty or overly dramatic but more a workout for the grey matter. 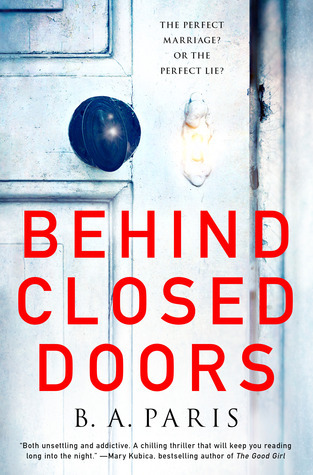 This was a book that makes you read between the lines as you try to imagine just what does actually go on behind closed doors. At first glances, Jack and Grace Angel are the ideal perfect couple. The people that know them want to emulate them, they are jealous of how in love they are, the house they have and the life they perceive to lead, but we all know that appearances can be extremely deceptive. Told from Grace’s point of view with flashbacks to past and present, BA Paris cleverly weaves the sorry tale of the Angel’s and one psychopathic husband. Jack is a forty-year-old, highly successful lawyer, who is the front runner in domestic abuse cases. He battles for the battered women and has never lost a case…he even has a job that makes you want to love him…add into the mix he is drop dead gorgeous and Grace never really stood a chance. Grace is a thirty-two-year-old successful buyer for Harrods that has lived her life for one person and one person only, her sister Millie who is seventeen and has downs syndrome. Millie boards at a special school and Grace works all the hours to provide for that schooling. She is biding her time until Millie turns eighteen when she can finally come to live with her. Grace and Millie meet Jack on one of their frequent visits to the park, as Millie is dancing on her own with her arms around an imaginary dancing partner, Jack does the unthinkable and dances with her…cue heart melting into a pile of mushy goo. This is exactly what happened to Grace…cue whirlwind courtship and marriage with Jack promising to provide everything for Millie if Grace gives up work and becomes his wife as Jack is tired of coming home to an empty house and bed…this is where you wonder where the hell Jack Angel went. While the flashbacks to past and present worked, I personally felt that this could also have worked in chronological order and may have actually flowed a little better…there is only a little over a year covering the whole book so the time lapse wasn’t that great. My need for the present was greater than for the past, but the little snippets that we got from those past chapters only intensified the need to keep page turning as little by little the real Jack Angel stood up. The brief look we got into his past was jaw dropping and while it went some way in trying to justify the man he was, really it was just the match that started the raging fire that must have already been on a slow burn, because one instance did not maketh the man that Jack Angel became. The ending, while predictable was delivered in style if not a little rushed, however, the last two lines summed up this book perfectly and delivered one hell of an emotional impact which really brought together the whole plot line. This was extremely clever and left me giving the author a clap and a mental high five. What is it with red rooms…?